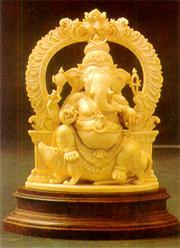 In the images and pictorial representations Ganesha is seen wearing a serpent girdle around his waist. In some figures, the serpent is seen sporting across his left shoulder like a sacred thread. This cold blooded reptile gives Ganesha a look of aversion. But this is a meaningful detail which cannot be avoided in his make up. In the set up of one of the seals of the Indus Valley, there is the figure of a yogi flanked on either side by two suppliants with the figure of a serpent standing erect on its tail. The date of this seal may be between 4000 B.C. and 3000 B.C. Similarly in one of the relics of the ancient Mesopotamian civilization there is the find of a goblet used by king Gudea of Lagash in connection with some fertility rite. On this goblet among other figures is seen a figure of two serpents entwined in an amorous embrace. This goblet is said to belong to a period round about 2500 B.C. The serpent standing erect on its tail in the seal of the Indus Valley is probably indicative of the awakening of Kundalini Sakthi (serpent energy) in the yogi as a result of his asceticism. Kundalini Sakthi is the coiled energy lying dormant in all beings which is symbolised as a serpent lying in coils. The entwined serpents seen in the Mesopotamian goblet are probably indicative of the positive and negative or the male and the female principles involved in this energy which is responsible for the appearance of the entire universe. In ancient Mesopotamia the symbol of entwined serpent was also used as the symbol of the God of healing, Ningishizda. This symbol was later on adopted by the Greeks. The Greek God of healing was called Askilapios who was worshipped at two great centres, viz., Rome and Epidaurus. Epidaurus has been called the Laurdes of the ancient world. Sufferers came to this Temple and spent the night there in the darkness. The emblem of Askilapios was a snake. Accordingly, tame and harmless snakes were let loose in the dormitories. When they wandered and touched the sick people lying there, they thought it was the touch of God and they were healed. The Romans honoured this emblem by the design of caduceus, the staff carried by Mercury the messenger of their Gods. A representation of this staff is used as an emblem by the medical profession all over the work and as the insignia of the U.S. Army Medical Corps. The emblem of entwined serpents is also seen guarding the Holy cross mounted on the official staff of certain christian church dignitaries consecrated by His Holiness the Patriarch of Antioch. Athena Palias the Patron Goddess of the City of Athens is depicted in the coins belonging to the First Century B.C. holding a serpent entwined Spear.